Bhagat Singh is the one of the well-known Indian Freedom Fighter whose contribution in getting freedom for India against British Rule was significant. Bhagat Singh is also addressed as Shaheed (Hindi Language word) Bhagat Singh which means martyr, Bhagat Singh. Bhagat Singh was imbued from childhood with the family’s spirit of patriotism. Bhagat Singh was born on 27 September 1907 at Banga in Lyallpur district. This place is in Pakistan now. His father name was Kishan Singh and mother was Vidya Vati. When Bhagat Singh was born, his father Kishan Singh was in jail. His uncle, Sardar Ajit Singh, established the Indian Patriots’ Association. Ajit Singh had 22 cases against him and was forced to flee to Iran. Bhagat Singh was considered to be one of the most influential revolutionaries of Indian Nationalist Movement. He became involved with numerous revolutionary organizations. During teenage, he was a great follower of Mahatma Gandhi. He started following Non-Cooperation Movement called by Mahatma Gandhi. Bhagat Singh had openly defied the British and had followed Gandhi’s wishes by burning the government-sponsored books. Due to violent incidents of “Chauri Chaura”, Gandhi called for the withdrawal of the Non-Cooperation movement. But Bhagat Singh was unhappy with his decision. So, he isolated himself from Gandhi’s nonviolent action and joined the Young Revolutionary Movement. His parents planned to get him married when he was pursuing B.A. examination. But he rejected the suggestion and said that, if his marriage was to take place in Slave-India, my bride shall be only death.” He later joined the Hindustan Republican Association, a radical group, later known as the Hindustan Socialist Republican Association. He returned to his home in Lahore after assurances from his parents that he would not be compelled to get married. On 30 October 1928, an all-parties procession, led by Lala Lajpat Rai, marched towards the Lahore railway station to protest against the arrival of the Simon Commission. To stop the procession, police made a lathi charge (hitting with the police stick) at the activists. The confrontation left Lala Lajpat Rai with severe injuries which led to his death. As revenge to the death of Lala Lajpat Rai, Bhagat Singh and his associates plotted the assassination of Scott, the Superintendent of Police, believed to have ordered the lathi charge. The revolutionaries, mistaking J.P. Saunders, an Assistant Superintendent of Police, as Scott, killed him instead. Bhagat Singh quickly left Lahore to escape his arrest. To avoid recognition, he shaved his beard and cut his hair, a violation of the sacred tenets of Sikhism. The British authority, while interrogating them, came to know about their involvement in the murder of J. P. Saunders. 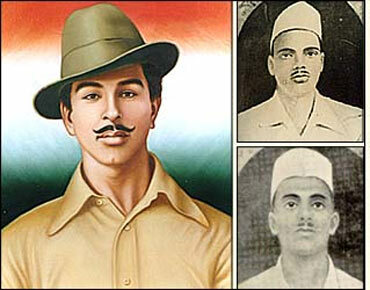 Bhagat Singh, Rajguru, and Sukhdev were charged with the murder. Singh admitted to the murder and made statements against the British rule during the trial. Bhagat Singh along with other revolutionaries found responsible for the Assembly bombing and murder of Saunders. On March 23, 1931, Bhagat Singh was hanged in Lahore with his fellow comrades Rajguru and Sukhdev. Singh was cremated at Hussainiwala on banks of Sutlej river. There are several movies released on the life story of Bhagat Singh. If you want to know more about him, must watch those movies.